New babies can make it rough for a big sister. Getting her excited about the new sibling can help and so can our personalized big sister t-shirts. This can be a gift from the new baby and big sisters LOVE to give a gift back like our little brother or little sister onesies. 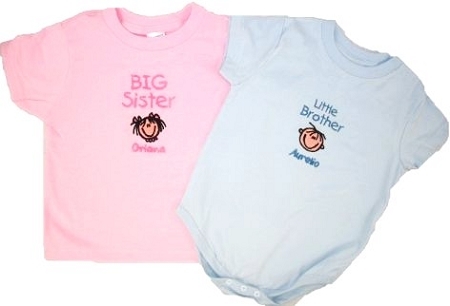 What`s more adorable than matching shirts for your big sister and sibling? Our personalized big sister t shirt and creeper for a little brother or little sister is an adorable set that any Mom would love at your next baby shower. Recommended ordering one size up if unsure, to allow for growth and shrinkage.